Whenever you discuss a "classic" in any field, nostalgia plays a large role. What is classic to one might be junk to another. To most people, anything that was around when they were younger is considered a classic. The rather insightful song "1985" asks a question: when did Motley Crue become classic rock? The answer is, the Crue became classic around the time that people who loved them as kids "grew up". The lens of nostalgia makes any old thing you remember look much better than it may actually deserve to be. 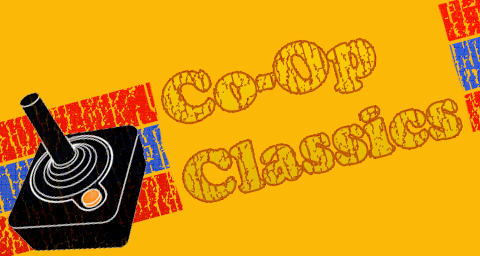 Today's co-op classic, Twin Cobra, is a good example of this effect. Several years ago, I took on the task of converting an old, gutted, busted up Q*Bert cabinet into a MAME machine. A friend of mine was quite interested in the whole process, and I kept him updated on how things were going. We'd discuss some of our favorite games from the past, and one that he kept mentioning was Twin Cobra. Apparently, a convenience store in his neighborhood had a Twin Cobra machine, and he fed it many quarters over the years. Once my cabinet was in playable condition, we made arrangements for he and his wife to come over. I made sure that Twin Cobra was available for us to play, and out of curiosity, I fired it up ahead of time to check it out myself. The game may sound like a cheesy 80s Stallone flick, but instead, it's a reference to the two helicopters that players can control. Simultaneous gameplay wasn't exactly new in 1987, but still, it was an attractive feature, and words like "Twin" and "Double" made it to game titles often. 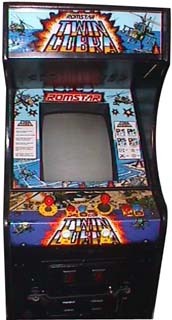 Twin Cobra is a vertically scrolling shoot em up, pitting the players' copters (red and blue, naturally) against wave after wave of enemy copters, tanks, and turrets. Large gun copters appear in your flight path from time to time, and once destroyed, they drop power ups of different colors. Your weapons power up in several ways, including adding a spread shot, changing to a continuously shooting laser, or even a very powerful four way strike. You can drop a limited amount of bombs which clear a good portion of the screen. Enemy helicopters and bullets must be avoided entirely, but tanks and turrets can be flown over without harm. Twin Cobra is fairly typical for a game of its age. Page created in 2.3294 seconds.